Stephen first asked us to write down what we thought was the true meaning of Christmas. As a group we assembled a picture of the Christmas story we have inherited, the traditional Nativity scene. Our scene included: Mary, Joseph, the baby Jesus, a manger, a stable, animals, shepherds, three kings bearing gold, frankincense and myrrh, and a star. Then we turned to the gospels – remembering that they are not historical, but theological teaching aids, written by the church for the church. Mark and John have no birth narratives, so we looked at Matthew and Luke. After reading Matthew 2: 1-18, we shared Matthew’s account of the Christmas story, removing from our Nativity scene all those things that don’t appear in Matthew’s story. So we removed the manger, stable, animals, shepherds, and also the three kings. We then added to the scene what does appear, but isn’t there yet – ‘astrologers from the East’. What difference does it make replacing kings with dodgy foreign astrologers, and leaving them as the only visitors who came and worshipped? Where is the king in this story, and how does he react to the news of the birth? So what’s the message of Matthew’s version of the Christmas story? 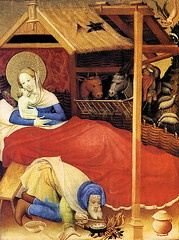 We then moved to Luke’s account of the Christmas story in Luke 2: 1-20. We restored our original Nativity scene, and after discussion we removed whatever doesn’t appear in Luke’s story: ie the three kings and the star. We thought about the shepherds, the baby’s only visitors: dirt poor and semi-nomadic, distrusted by townsfold, craft and cunning enabling them to cope with the harsh desert environment. They were religiously unclean because they kept animals, they were smelly and unwholesome, and they were nobodies for whom no one else cared. What difference does it make having desert shepherds (sent by an angel and heavenly choir) as the only visitors with an official invitation? Is the message of Luke’s version more like Matthew’s, or the typical Nativity scene? So we have in our Bible two different stories of the almost hidden arrival of Jesus, only spotted by people on the very edge of the known and acceptable world. These stories tell of a birth that implicitly challenges the way things are and undermines people who think they are in control. With the passage of time they seem to have been overwritten with a softer, safer story that is non-threatening. Who benefits? What is lost? 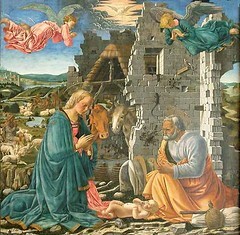 Does the pretty, soft Nativity comfort or tell the truth, that in God’s eyes we are all equal. God welcomes nobodies and uses nobodies to do his work. 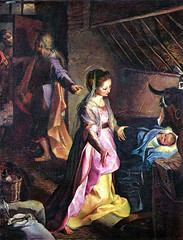 What did we think was the true meaning of Christmas before we began this study? Do we still think the same now? The Church should be the home of Everybody, and Governments should be afraid because these birth stories tell of a baby who will turn society on its head.